Indian Space Research Organisation (ISRO) has released notification for the application of 171 vacancies of Junior Personal Assistant and Stenographer. 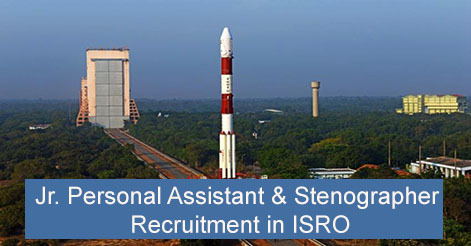 ISRO invites applications from eligible candidates for the posts of Junior Personal Assistant and Stenographer. Candidates can apply for the vacancy before 30th April 2018. 2. Diploma in Commercial/ Secretarial Practice with 1st Class alongwith 1 years experience as Steno-Typist/ Stenographer . 3. Minimum speed of 80 w.p.m in English Stenography. 4, Knowledge in use of Computer. Candidates will be selected for the job on the basis of a written test. Help us to improve this article/job posting "Junior Personal Assistant & Stenographer Recruitment in ISRO". We would be glad if you can comment below and provide your valuable suggestions and feedback. If this page have any wrong information/list or out of context content, then you can report us as well.